This, this right here, is heaven in a bowl. Seriously yummy salad. Such a good combination of flavors. I found the recipe in a recent issue of “All You” magazine and then tracked it down online and pinned it. You can find it here, on the “My Recipes” website. 1 Preheat grill to high. Toss sliced zucchini and fennel in 1 tablespoon olive oil and season with salt and pepper. Grill (in batches, if necessary) until just tender, 2 – 3 minutes per side for zucchini, 3 – 4 minutes per side for fennel. Remove from grill and let cool slightly. Cut crosswise into 1/2″ pieces. 2 Remove skin from chicken, pull meat from bones and shred meat. 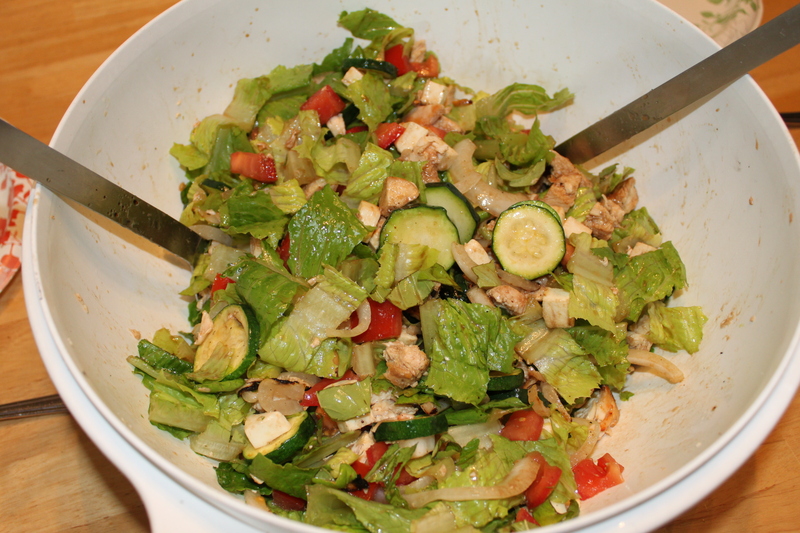 In a large bowl, mix chicken with greens and grilled vegetables. Toss in tomatoes, olives, mozzarella and basil. 3 In a small bowl, mix vinegar, sugar and 1/4 teaspoon each salt and pepper. Stir to dissolve sugar. Add remaining 3 tablespoons olive oil, whisking to combine. Drizzle vinaigrette over salad, toss and serve.